With its blazing fight choreography and political overtones, Lo Wei’s Fist of Fury cemented itself as an integral part of Chinese cinema and identity. The legendary Bruce Lee solidified his status as the undisputed king of kung fu playing Chen Zhen, a disciple of the renowned Chin Woo Athletic Association. Inspired by the kungfu craze sparked by Bruce Lee in the 1970s, Tony Yeow and James Sebastian's Ring of Fury is Singapore’s first and only martial arts film. It was banned for 32 years before seeing the light again in 2005. 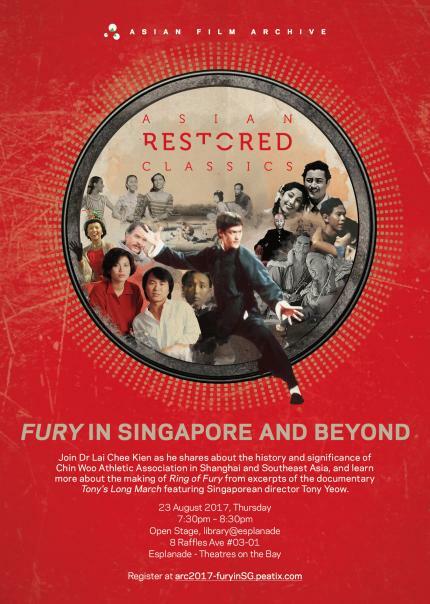 Join Dr Lai Chee Kien as he shares about the history and significance of Chin Woo Athletic Association in Shanghai and Southeast Asia, and learn more about the making of Ring of Fury from excerpts of the documentary Tony's Long March featuring Singaporean director Tony Yeow.